The Consumer Price Index measure of inflation, how it's calculated, and why it's important. Every month, the Bureau of Labor Statistics reports the Consumer Price Index, or CPI, the most widely used measure of inflation. The CPI is produced by following the monthly changes in the prices paid by urban consumers for a representative basket of goods and services. While it may not be the best measure of the inflation rate, the consumer price index is tied to numerous rates that makes it important for investors to follow. Inflation is the level of decline in the purchasing power of money as the prices of goods and services increase. For example, if you live in Venezuela, where the inflation rate is 56%, you need 56% more money than you did a year ago to buy the same basket of goods and services. In the U.S., the consumer price index is just one method to track the inflation rate. The Federal Reserve has recently put more emphasis on the personal consumption expenditures inflation rate, which you can read about here. The Consumer Price Index for All Urban Consumers, or CPI-U, is commonly referred to as the consumer price index, or CPI. The CPI is meant as an approximation for the spending patterns for all urban consumers, who represent 87% of the total U.S. population. The CPI tracks a basket of goods and services that is determined by survey results provided by roughly 7,000 families from around the country. The basket is updated every two years based on the survey results. The Bureau of Labor Statistics reports the consumer price index in the middle of the month; a full schedule of upcoming releases for the consumer price index can be found here. The Federal Reserve generally targets inflation of 2%. Lately, though, inflation has been running below the Fed's target. 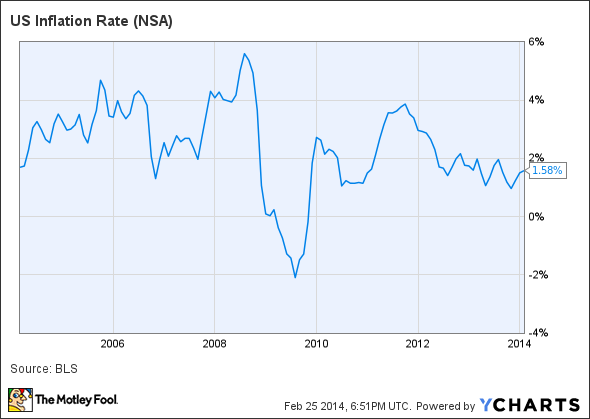 U.S. Inflation Rate data by YCharts. While inflation hasn't been much of an issue in the U.S. in the past decade, in other parts of the world it is a major issue. Venezuela is a prime example: The value of the country's currency is spiraling downward. Inflation is rising so quickly in Venezuela that you hear stories of shopkeepers not bothering to put prices on goods, instead having customers ask about the price of each item. Social Security. Since 1975, Social Security benefits have been adjusted for inflation, though they're adjusted using the CPI-W instead of the standard CPI-U. The CPI-W is the Consumer Price Index for Urban Wage Earners, and it differs slightly from the CPI-U in that it only includes survey samples paid by households where people are actively working. Treasury inflation-protected securities. Treasury inflation-protected securities are bonds that pay a fixed coupon. However, principal adjusts upward with inflation and downward with deflation. Education is half the battle -- learning about the factors affecting markets and how they impact you personally. The other half of the battle is how you invest both your time and money.